English: Bamboo antshrike; French: Batara fascié German: Zebra-Ameisenwürger; Spanish: Batará Franjeado. 7 in (17-18 cm); heavy hooked bill and red iris. Southern Central America and north-central South America; from Honduras to Panama, and in Venezuela, Colombia, Ecuador, Guyana, eastern Peru, northern Bolivia, and western Amazonian Brazil. Typically below 3,300 ft (1,000 m) in humid tropical forest; vine-tangled and shrubby borders of streams and rivers and tree-fall openings in intact forest; also, mature secondary forest. Nonmigratory, territory-defending pairs forage widely at various levels of a dense forest canopy. Song is a series of 6-8 soft, repeated whistles. French: Batara onde German: Mormor-Ameisenwurger; Spanish: Batara Ondulado. 9 in (23 cm); relatively short tail, a massive hooked bill, and brown to pale-orange iris. 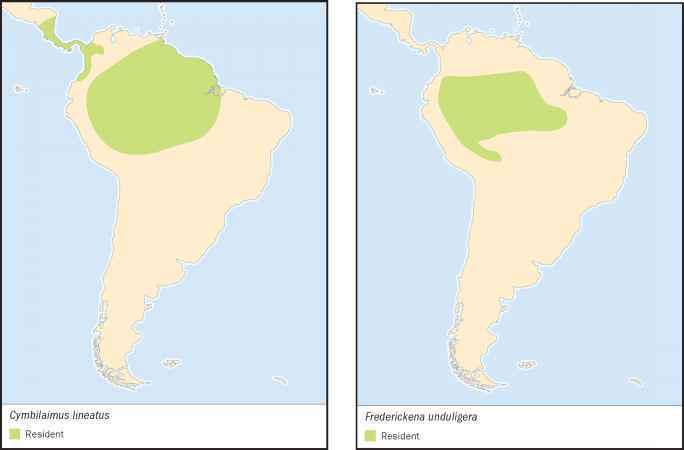 Northwestern South America, including Colombia, Ecuador, Peru, Bolivia, and western Amazonian Brazil. Typically below 2,300 ft (700 m) in humid, lowland tropical forest; dense undergrowth vegetation and vine-laden tree-falls within terra firme (non-flooded) forest. Nonmigratory, territory-defending pairs that forage close to or on the ground. Song is a series of 11-16, high-pitched, repeated notes. The head crest may be raised when calling, and the tail may wag as well. Largest species of the formicariids: 12.5-14 in (30.5-35.5 cm), with a relatively long tail and a massive bill. 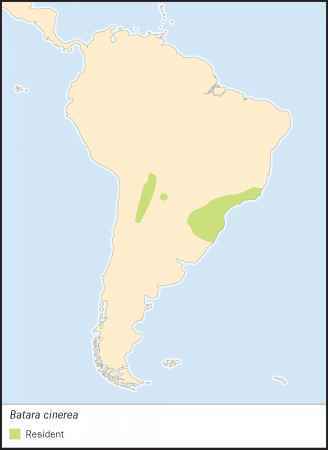 East-central South America, including the eastern slope of the Andes Mountains in Bolivia, northern Argentina, and in a separate range in southeastern Brazil and northeastern Argentina. Up to 9,800 ft (3,000 m) in humid tropical and montane forest, forest-edges, and dense thickets in higher woodland; dense vegetation of the lower or middle parts of the forest canopy. Nonmigratory pairs defend a relatively large territory. They forage close to the ground or in the middle canopy. They are a rarely seen shy and skulking bird. Song is a loud, rather fast series of repeated, ringing, musical notes. Uncommon species but can be locally abundant, and not threatened. English: Chapman's antshrike; French: Batara rayé; German: Bindenwollrucken; Spanish: Choca Barreada. 6.5 in (16 cm), with a yellow iris, long tail, and a large hooked bill. 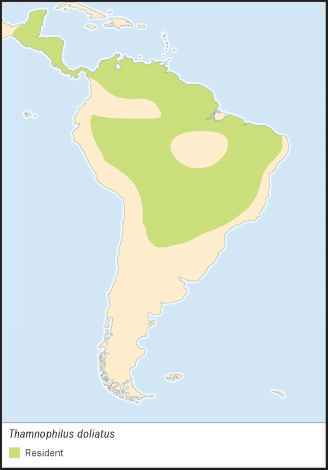 Much of tropical South America and Central America; east of the Andes as far south as Bolivia, Paraguay, and northern Argentina; widespread farther north except for the heart of Brazilian Amazon; as far north as southern Mexico. 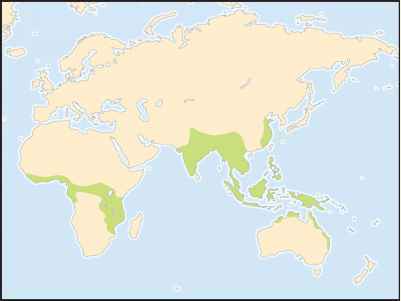 Up to 6,600 ft (2,000 m) in tropical forest-edges, thickets, open woodland, and in vegetated clearings and gardens, ranging from humid to more arid habitats.